See below for our discussion of the disappearing reflection coefficient in a balanced amplifier. A quadrature coupler is one in which the input is split into two signals (usually with a goal of equal magnitudes) that are 90 degrees apart in phase. Types of quadrature couplers include branchline couplers (also known as quadrature hybrid couplers), Lange couplers and overlay couplers. 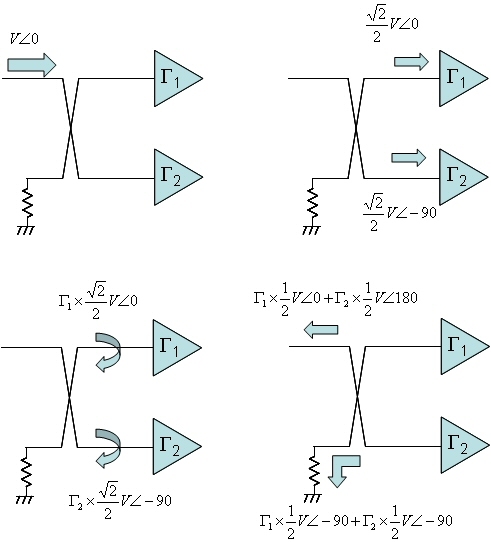 One excellent use of quadrature couplers is to impedance match pairs of devices. The devices are arranged so that reflections from them are terminated in a load that is isolated from the quadrature coupler's input. This trick is possible only because of the 90 degree (quadrature) phase difference of the coupled and through arms. 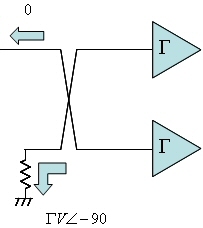 When transistors are combined using quadrature couplers, this is called a balanced amplifier. Quadrature couplers are also used to make reflective attenuator devices (such as shunt PIN diodes) become absorptive. Another use for Lange or overlay couplers is to form a diplexer, where one port passes DC while the other port passes RF. This structure can be used as a bias tee. Overlay couplers were very popular back in the 1970s within soft substrate stripline boards. Recently they are being used again, in some of the new multilayer media such as LTCC. The problem with overlay couplers is that none of the CAD software packages provides an easy way to design them. So you end up spending a week with electromagnetic simulations in what would take five seconds if it was a planar quadrature coupler. Our page on coupled line couplers continues this discussion. Was Smitty really marooned on the island all week long? Quadrature couplers are often used to power combine amplifiers, such a structure is called a balanced amplifier. This allows an important degree of freedom, so long as the amplifiers have the matched reflection coefficients on inputs and outputs, the network will have good impedance input and output impedance matches. What's going on? The figure below will help you visualize it. A signal of amplitude "V" at phase angle zero enters the network, and splits. The upper amplifier is excited with half of the signal (0.707 x voltage) at phase angle zero, while the lower amp see the same signal but phase shifted -90 degrees. Now, what happens in the ideal case where your two amplifiers have the same reflection coefficient? The signal returned to the input port cancels out, and all of the reflected power goes to the load. See our page on balanced amplifier VSWR for an analysis of this phenomenon using Microwave Office.